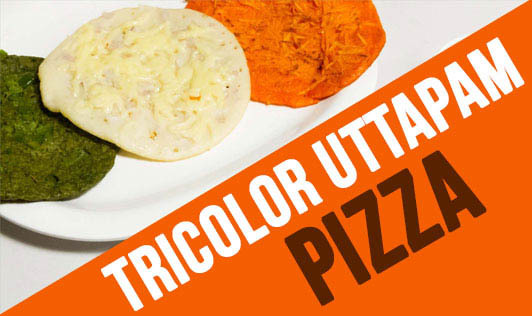 The tricolor uttapam pizza is a colorful and appealing dish, which is both nutritious and flavorful. The combination of various veggies like carrots, corn, capsicum, onions, and tomatoes makes this dish an extremely healthy breakfast option for kids. Heat the oil in a nonstick pan, add onions and sauté until they turn golden brown in color. Add the chopped tomatoes and salt and cook for some time. Turn off the gas and keep aside. Keep the corn, capsicum, and carrot in 3 different bowls. Heat a nonstick tava or griddle on medium flame. Once hot, put a ladle of batter on it and spread it evenly outwards. Spread a tablespoon of onion and tomato sauce on it. Spread the capsicum, carrots, and corn to make 3 different layers on the uttapam. Garnish the top with a little cheese. Serve hot with either chutney/ketchup or sambhar. Tip: Arrange the vegetables in a way that you get three different layers on the uttapam.